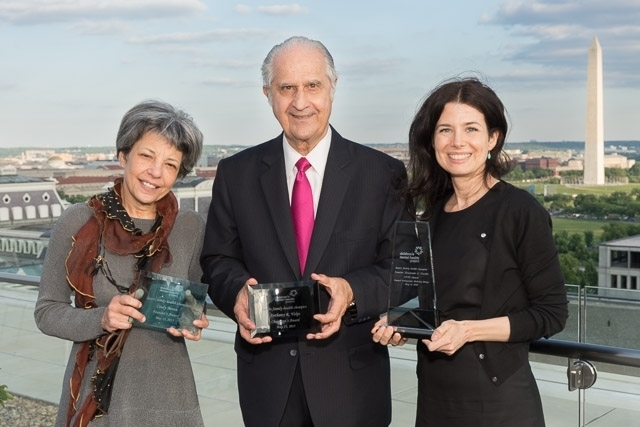 On a gorgeous terrace overlooking the Washington monument last evening, the Children’s Dental Health Project (CDHP) honored three champions who have strengthened the safety net for families through their commitment to oral health. CDHP recognized the outstanding work of Senator Benjamin Cardin, Cindy Mann, and Dr. Anthony Volpe. When CDHP was founded 19 years ago, oral health was a sidelined from health policy discussions. Since then, tens of millions of children gained comprehensive and affordable dental benefits. Today, children with public coverage receive more oral health services than those with private insurance. With the recent 2-year extension of the Children’s Health Insurance Program, we can focus on how those benefits improve children’s health and prospects. We salute these inspiring leaders for helping to drive change so more children, and their families, can thrive. Sen. Benjamin Cardin (Md.) received the EPIC Award (Engaged Policymakers Initiating Change). CDHP’s Meg Booth presented the award to Beth Vrabel, Sen. Cardin’s health policy advisor. Since the tragic death of Deamonte Driver, a 12-year-old from Maryland who succumbed to an untreated dental infection, Sen. Cardin has been a tireless advocate for children’s oral health, ensuring that coverage is stable, meaningful, and affordable for all families. Anthony Volpe received the Chairman’s Award from Dr. Fotinos Panagakos. Throughout his career, Dr. Volpe has guided and inspired countless oral health professionals while advancing the state of science and research in dental care. A supporter from CDHP from its inception, he was early to recognize the critical role of public policy in improving the lives of all Americans, especially those at greatest risk for dental disease. Cindy Mann received the Founder’s Award from Dr. Burton Edelstein. As deputy administrator of the Centers for Medicare and Medicaid Services from 2009-2014, Ms. Mann oversaw the nation’s largest health program, serving 70 million Americans and overseeing expansions of Medicaid and the Children’s Health Insurance Program. Her commitment and compassion have strengthened systems of care. She and her team made oral health a priority, bringing new focus and resources to children’s oral health. Oral health needs more champions, and there are a variety of ways to become a champion. One way is to invest your time and energy through a nonprofit or community organization that works on health and/or children's issues. Another way is to invest financially in the good work that existing organizations are doing. CDHP would welcome your support. Click here to make a tax-deductible donation.